The Brewster Aeronautical Corporation was a North American defense contractor that operated from the 1930s until the end of World War II. It started existence as an aircraft division of Brewster & Co., a company that originally sold carriages and had branched into automobile bodies and airplane parts. In 1932, James Work, an aeronautical engineer, bought the division for US$30,000 and created the Brewster Aeronautical Corporation. Brewster started out making seaplane floats and wing panels, but with the hire of chief engineer Dayton Brown, it embarked on its own designs. It operated three aircraft plants, at the Brewster Building in Long Island City, New York, Newark, New Jersey, and, in 1941, in Warminster Township, Pennsylvania, which was then known as NAS Johnsville. Brown's first, in 1934, was a two-seat scout-bomber, the Brewster SBA, which first flew in 1936, but subsequently the Naval Aircraft Factory built them, with the designation SBN-1. The SB2A Buccaneer was a follow-on design that first flew in 1941 and was also used by the Royal Air Force, who named it Bermuda. 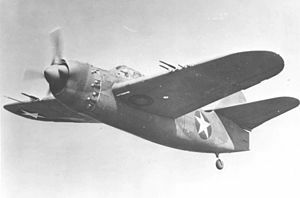 A design in 1936 for a carrier-capable monoplane resulted in the Brewster F2A (named Buffalo by the British), which was chosen over an early version of the F4F Wildcat. The F2A prototype handled well in 1938 tests, and the Navy ordered 54. However, production was slow, at least partly due to an inefficient factory in Queens, New York. The Navy ended up ordering Wildcats, which by 1938 had been greatly improved. The Buffalo was exported to Finland starting in 1939, and more were intended for Belgium, but the country was overrun in the early stages of World War II, before deliveries could begin. The United Kingdom also received Buffalos, which eventually ended up in the East Indies. They engaged in combat with Japanese Zeros and suffered badly. The Buffalos were most popular with the Finns, who not only used them successfully against the Soviet air force but even built a slightly improved version known as the Humu. The Dutch also purchased 92 Buffalos and assigned most to the Militaire Luchtvaart KNIL in the Dutch East Indies (now Indonesia) where they fought against the Japanese. Several were captured by the Japanese and were repainted with Japanese Hinomaru insignias and extensively tested. During WWII it became apparent that Brewster was mismanaged. The company had grown from a relatively minor aircraft parts supplier to a fully-fledged defence giant in only a few years. Jimmy Work had hired Alfred and Ignacio Miranda as the company salesmen. They had been involved on frauds, spending two years in prison for selling illicit arms to Bolivia, and had over-promised Brewster production capabilities to customers. As WWII had swelled the defense industries, the quality of the newly hired work force was inferior in skills and often motivation, and the work was plagued by illicit strikes and even outright sabotage was suspected. The Navy installed George Chapline as president of the company, easing out Jimmy Work, in the hopes of speeding up production, but then in early 1942 Jimmy Work regained control of the company, just in time to be sued for US$10 million for financial misdeeds. In May 1942 the Navy simply seized Brewster and put the head of the Naval Aircraft Factory in charge. When the Navy cancelled Brewster's last contract, for assembly of the F3A-1 Corsair, the company was in serious trouble. In October, after reporting a large loss, the management decided to shut down the company, and on April 5, 1946, the Brewster Aeronautical Corporation was dissolved by its shareholders. SB2A Buccaneer (Bermuda in British service). XA-32 Experimental single seat ground attack aircraft.